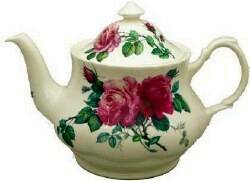 A pretty 6 cup white bone china teapot decorated with two large roses by Roy Kirkham. Dishwasher and microwave oven safe. 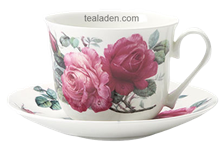 A pretty six cup white bone china teapot decorated with two large roses by Roy Kirkham. One rose is a dark pink and the other rose is a light pink with little rosebuds. Lots of green leaves gives the roses a wonderful just picked appearance. Perfect teapot for a casual tea. This teapot will also work with a more formal tea because of the pretty curved handle and the graceful shape of the pot.